Here is a transcript of this video: Welcome to MyBinding video. 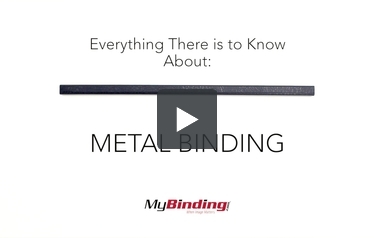 This is everything there is to know about metal binding. There are sizes ranging from 5mm to 32mm and they hold up to 300 pages. With metal binding, you use matching hard covers when binding your pages. There are several different styles of binding and covers to match them. There are a few colors to choose from. This binding requires a specific binding machine. The machine presses your binding together, applying lots of pressure unto your pages, keeping them together. It may take a decent amount of force but it’s overall a simplistic approach, not to mention it is a permanent binding solution. There is no editing books once it’s bound. And that is metal binding. For more demos, reviews and how-to’s, go to MyBinding.com.